Extra virgin olive oil (EVOO) is the pressed juices of olives. It is very very low in acidity. The traditional and most natural methods process the olives mechanically without the use of heat or chemicals. EVOO is considered a healthy fat, because it is high in polyphenols, antioxidants, and good fats (monosaturated fats) which play a role in reducing the risk of heart disease. There are ongoing studies investigating the possible benefits of extra virgin olive oil in other health conditions, including diabetes, cancer, obesity, osteoporosis, depression, and Alzheimer’s. The best way to use EVOO is for salad dressings, condiments, dips, and drizzled over hot or cold dishes just prior to serving. It pairs especially well with mild foods, such as bread, vegetables, fish, eggs, and potatoes. Air, light and heat will oxidize the oil. That is why the bottle for your EVOO should be opaque. Be sure to screw the cap on tightly after each use, and store your bottle away from the stove, preferably in a dark and cool pantry. To ensure freshness, EVOO should be consumed within 6 months of opening. At the EVOO tasting event, I learned why some extra virgin olive oils are so much more affordable than others. It turns out that there’s more to it than just the quality (or grade) of the olive fruit, the climate conditions, and the number of fruit origins (e.g. monocultivar verses blends). Other factors include the ripeness of the fruit when it was picked (e.g. if ripe when picked, the EVOO will be smoother, lighter, buttery, and less bitter), how it was picked (e.g. hand picked with nets to prevent bruising), the length of time that passed from picking and processing (e.g. within 24 hours), the processing method, and the batch number. High grade EVOO is made by mechanical means such as cold pressing. Lower grade olive oil may be processed using chemicals. The first cold pressed batch of olive oil has the best quality. The best companies only press their olives once. Lower quality EVOO may be the product of a “watered-down” second or even third batch. If you’re shopping for Italian EVOOs in particular, you may see D.O.P. on the label. D.O.P. stands for Protected Designation of Origin. This means that the food was grown and packaged in Italy and that the product was processed using traditional methods. Note that D.O.P. products tend to cost more. Studies have shown that lower quality EVOOs do not contain as many health-benefiting compounds as high quality EVOOs. So, my suggestion is to use the highest quality EVOO that you can afford and to select your EVOO wisely based on the processing method as opposed to organic or GMO designations. High quality EVOO has well balanced fruitiness, bitterness, and spiciness. The main factors that affect the taste of an EVOO are: the type of olive tree, the region (i.e. climate and soil) in which it was grown, and the time the fruit was harvested. But the most important factor is personal preference. Spanish olive oils tend to be golden yellow in colour and have a fruity, nutty flavour. French olive oils tend to have a pale colour and mild flavour. Greek olive oils tend to be green in colour and have a stronger flavour and aroma. Italian olive oils tend to be dark green in colour with an herbal aroma and a grassy flavour. 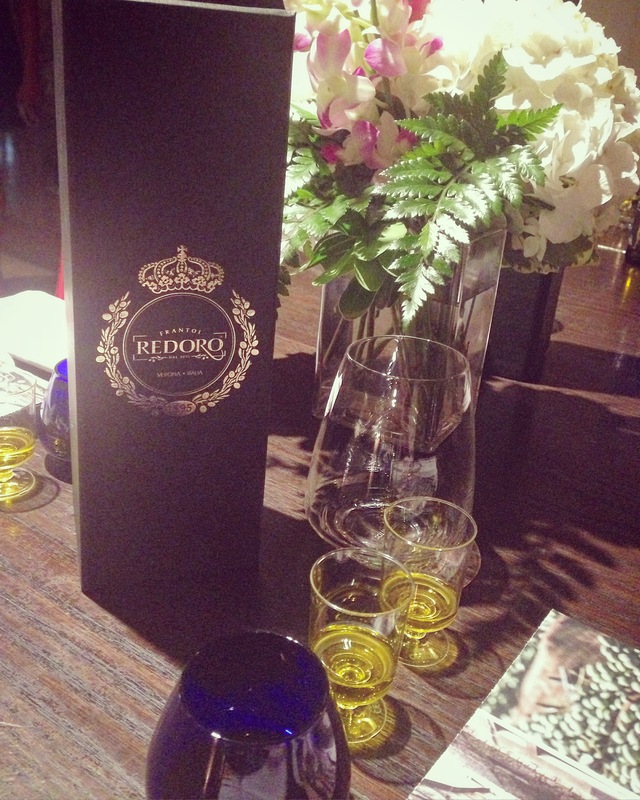 To serve the EVOO, use small wine glasses or shot glasses. Professionals use small blue-coloured glasses that look like votive candle holders (see the photo below). Pour 1 or 2 tablespoons of EVOO into each of the tasting glasses. For your tasting, it is best to provide plain bread, water, and granny smith apple slices. Bread, as with other types of food will enhance different flavour notes of the oil, and vice versa. The water and apple slices are for cleansing your palette in between samples. Sample the EVOOs in order from mildest to most robust flavour or from lowest to highest price per mL. Cover the top of the glass with your hand and swirl the glass around to release the aroma from the oil. Breath in the aroma and take notice of the flavours that you smell. For example, does it smell fruity? Grassy? While slurping, take in a sip of the oil and allow it to coat your entire tongue until it reaches the back of your mouth. But be warned that most EVOOs have a kick that will make you cough when they hit the back of your throat. Notice how the EVOO tastes. Is the flavour mild or pungent? Does it have a mild, medium, or cough-inducing kick at the end? What flavour notes do you notice? For example, does it taste fruity, nutty, buttery, bitter, peppery, and/or grassy? Then dip a piece of plain bread into the same EVOO and chew on it slowly. Notice how the bread affects the flavour notes of the oil and vice versa. The next step is to try different EVOOs with different types of food and to determine which pairings bring out your favourite balance of flavours.